The flashing provided by upturned edges of a watertight membrane on a roof. Any metal or composition flashing at the joint between a roofing surface and a vertical surface, such as a wall or parapet. 1. The flashing provided by upturned edges of a watertight membrane on a roof. 2. Any metal or composition flashing at the joint between a roofing surface and a vertical surface, such as a wall or parapet. Remove the existing roof down to the roof deck including all existing composition base flashing. Lay soldered corner flashing around the corner and over the base flashing. Roof membranes that are not resistant to a contaminant exhausted onto the roof, poor application of material, and/or neglect of the system are also reasons for leaks found in base flashing. 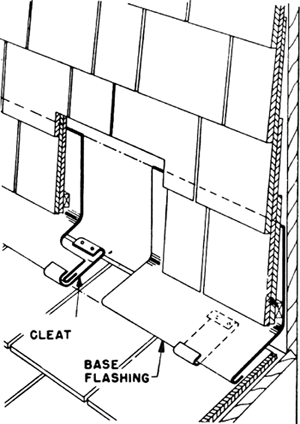 This mechanism covers the exposed edges or joints of base flashing. Tenders are invited for the project is generally described as the reroofing of low-sloped roofing, roof and base flashing and roof drainage, replacement of guardrails, and painting on the oil storage building. Tenders are invited for remove existing epdm associated flashings at roof penetrations,(except high walls) the underlying epdm roof assembly is to remain in place; repair any damaged and/or loose roof insulation; build or rebuild all curbs in order to achieve the required 10" base flashing height; remove all roof vent penetrations on vertical surfaces, and store for re-installation; mechanically attach a nominal (1/4" thick densdeck 4x8 boards to meet fm i-90 wind uplift requirements; 1 fastener per every 2 sf; over existing 10" iso insulation. The lower base flashing has a flexible rubber collar that friction-fits around the pipe; you install it and shingle around the metal base as you would a standard vent flashing. Tenders are invited for Battery Operated Led Base Flashing Tail Lamp For Railway Vehicles As Per Rdsos Specification No. You'll gain the confidence to expertly make both the hem folds for a base flashing (Photo 5) and the tricky, narrow, 1/4-in. removal of minor, non-friable asbestos containing roof strip and base flashing materials is included. After the copper had been ripped away from the roof, the base flashings were usually just covered over with tar and sealed.